3D data is generated through massive ‘point cloud’ datasets created by laser scanners that capture hundreds of thousands of points a second – every day. For weeks, months... years. 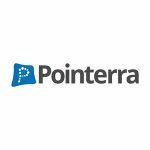 Pointerra (ASX:3DP) has created a technology that can take these massive 3D datasets – raw data, mostly in black and white and at enormous scale, which can obstruct the value it represents – and make it digestible and accessible via a web browser on any device, even a smartphone. 3DP’s technology allows people to see the data in full fidelity – integrated and in context – and then work in it and share it, without the need to download a terabyte of results to a heavy-duty PC. Essentially, thanks to 3DP, those who capture 3D data, and those who need it – such as engineers, surveyors, city planners, forestry experts, mining, oil and gas companies and more – will no longer need to wade through copious archives of inscrutable data for the information and insights they require. In the world of 3D data, the BIG problem to be solved was the scale and file size of 3D data sets and the difficulty in being able to interpret and make use of the data in a timely and cost efficient way. Since we last caught up with 3DP, the company has been busy finding ways and means to monetise its world-first technology solution to this problem and grow sales. However, it should be noted here that this company is still an early stage company and a speculative investment. Investors considering this stock for their portfolio should seek professional financial advice before making an investment decision. Its new deal with AAM, the largest geospatial solutions company in the southern hemisphere has put 3DP on the front foot globally to penetrate its core targeted industries. Governments conducting regular urban planning turn to AAM for 3D mapping, with AAM also providing geographic information systems (GIS) to cities across Africa, Asia and broader Australasia. The deal struck just this month will see AAM license 3DP’s 3D data technology via an MOU, to allow AAM’s customers to better visualise and analyse the data. In exchange, 3DP will receive a license fee as well as ongoing royalties from data usage, and will be free to sell AAM’s data sets via its world-first 3D data marketplace. For AAM, it means its GEOCIRRUS product (its cloud-based geospatial data platform) will receive a significant boost in functionality and applicability, and make it an even better product for AAM’s customers. 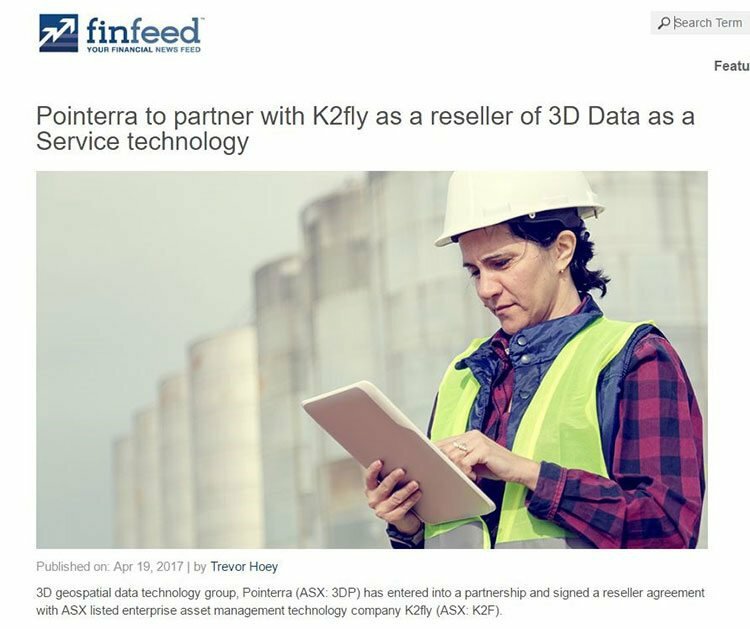 While the AAM deal is major news, 3DP’s other noteworthy move is the partnership and reseller agreement it has signed with ASX-listed asset management company K2fly (ASX:K2F). Through the arrangement, K2F will sell 3DP’s 3D data technology under a commission based sales model... which equals ongoing growth of its monthly Data as a Service (DaaS) customers. Not only will a reseller deal provide revenue diversification and predictability, it’s also a sign that 3DP is keen to partner with major players such as AAM as well as emerging small cap peers within both geospatial and digital asset management sectors... whenever a window of opportunity opens. With a current market cap of $7.8 million, cash held at $3.38 million (at last report in March) and its new squeeze in partner AAM Group, there’s plenty of news to catch up on. 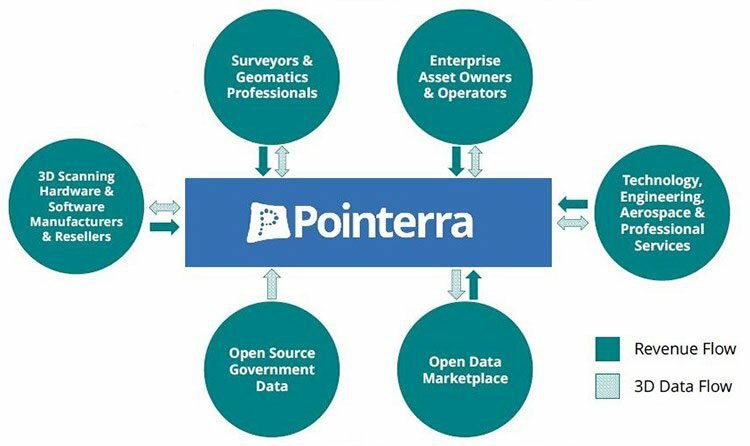 In our first article on Pointerra Limited (ASX:3DP) back in March – Little Known ASX 3D Data Player Swoops on $500 Billion Geospatial Industry – we looked at how geospatial technology connects people with the world around them and how 3DP’s technology is arranging 3D geospatial datasets in a format that can be quickly and easily processed, managed, used and shared. The essence of what 3DP does is connect generators of 3D data with users of 3D data in a form that everybody can understand and, more importantly, make use of. In the past few months, 3DP has been busy building on its business plan and reseller and revenue profit streams and as such looks to be attracting some major attention. Whilst we’ll come to 3DP’s MoU with geospatial powerhouse AAM shortly, it is interesting to note that even the analysts are taking a positive view. 3DP has garnered coverage from several analysts, including TMT Analytics who see an enormous amount of upside in the company and gave the 3DP a ‘buy’ recommendation and price target of AU$0.08, a significant boost from its current price of 0.024 cents. It should be noted, however, that broker projections and price targets are only estimates and may not be met. What we can gather from this is the costs of accessing digestible 3D data sets for businesses who need it will become more affordable, but will be ongoing which means continual revenue for 3DP. The sales pipeline is filling on a daily basis, and a big part of that relates to the conversion of trial customers into full-paying ones. Partnerships will be pivotal – so let’s revisit its most recent news. If you’re in the geospatial technology ‘space’ – what you really want is to capture the sights of a really big fish – like AAM Group. It should be noted here though that MoU is in its early stages and the effects yet to be known so investors should seek professional financial advice if considering this stock for their portfolio. AAM has been modelling the built and natural environment in 3D since 1995 and is the largest private holder of geographic information system data in Australia, with a comprehensive temporal library of 3D data and derivative products. If a company of this scale and influence has chosen to bring 3DP’s technology into its top-of-market GEOCIRRUS solution, what does that tell you about the quality of 3DP’s product? and 3DP will pay AAM a royalty based on data sales made through 3DP’s 3D data marketplace. This is a major milestone for a company still in its early stages of commercialisation, and still sub-$10 million market cap. But the figures could well rise considering 3DP is committed to a broader vision to secure similar licensing and partnership deals in future – not just within Australia but on a global level, monetising all the hard work 3DP has put into building this cutting edge technology up to now. For AAM, the benefits are pretty obvious too – the addition of 3DP’s ‘solution stack’ technology adds both scale and dimension for customers wanting to visualise and access considerable datasets... in a lot of cases, this is data that’s already there, but out of reach in a practical sense. The second major item crossed off 3DP’s list in recent months has been its new reseller agreement with the ASX-listed K2fly. K2F provides physical/infrastructure asset management to asset intensive industries via a software technology platform and consulting services. Being able to on-sell 3DP’s products, it can target certain high-value enterprise clients facing particular obstacles to leveraging and sharing their 3D datasets. Also, for 3DP it adds another source of revenue, which is never a bad thing – particularly in the areas of aerospace, drone operators and aerial mapping which K2F has significant exposure to. Again, the conversion of current trials into paying customers under a monthly fee model will act as an important fiscal basis for 3DP in a tech space where companies need to invest in R&D continuously to ensure its products stay relevant to the market. K2F’s announcement of its reseller status could well be simply the latest in a mounting series of similar collaborations – or, clearly that’s 3DP’s aim at any rate. Every day, all over the world, trillions of 3D points are captured in 3D data sets. What 3DP is doing is ‘turning the lights on’ so that the data can be seen at scale, in full fidelity, and be truly put to use. Rather than receiving ‘dumbed down’ or heavily simplified data – for the sake of scale and volume as well as file size – users of 3DP’s tech are able to have all the data, at scale, yet fully accessible. As well as a ‘solution stacker’ it’s also a piece of the puzzle that completes 3D data asset solutions – the final step to usability, in other words. As a major component of 3D data is to monitor temporal change, it means that the capturing of, and need for, 3D data sets is not going away anytime soon – and is likely to increase. This will become a bigger challenge the bigger the archives get... unless businesses use a platform like 3DP’s to interpret and see what they’ve got. We’re talking in the vicinity of petabytes of data – that’s a lot of zeros. We’re also talking about the true democratisation of 3D data globally – making it affordable and far more accessible than it’s ever been before. Bringing a key solution like this to a $500 billion global geospatial industry sounds like it could be a recipe for success to us. However investors considering this stock for their portfolio should still take a cautious approach, examine all publically available information and seek professional financial advice for further information. Now all that’s left to do is for 3DP to keep providing its worth and winning customers and partners, which it’s already well on the way to doing. Considering the ‘backlog’ of 3D data companies have gathered over the last decade or so since the technology became mainstream, there is huge potential to make use of this archived information, providing plenty of revenues and growth in the near-term. And it seems 3DP is, well, on Point and on track to take full advantage.